School Holidays wouldn’t be complete for me without a visit to wonderful Art Supplier Zart in Box Hill. Aiming to buy most of our art materials for the next ten weeks of art lessons I was pleased to find that there were some great new products and a “Hands On” area where products may be tried. Without too much effort I filled several trolleys and the staff helped me to lug the boxes out to my van in the 33 degree (91 degrees farenheit) heat. While they were processing my order I took the opportunity to take some photos in their Student Gallery upstairs. 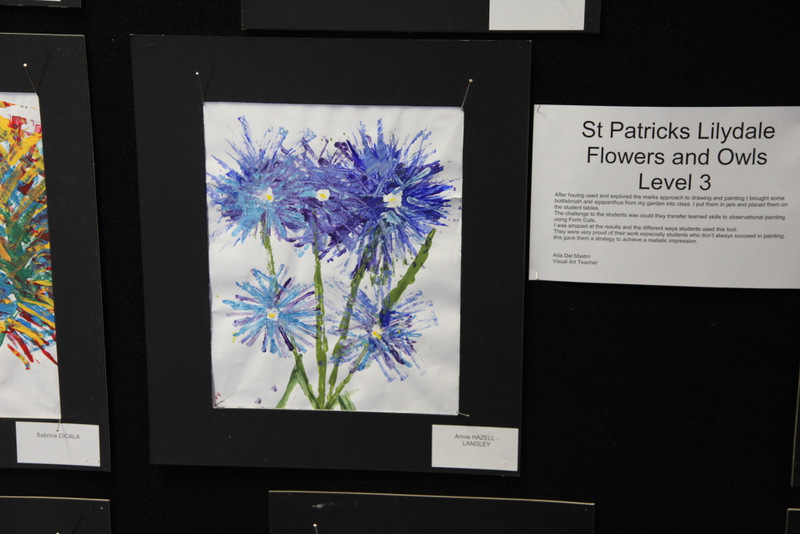 Congratulations to the students and Art Teachers from the featured schools. You have already and will continue to inspire us. There are 365 days per year of national pride for me as an Australian but even more pride today because it is January 26th, Australia Day. It is a Public Holiday and one of celebration of the great country we have, our character, our heritage and our relaxed lifestyle. We are known around the World for our unique wildlife so today I am adding some photos from my collection. 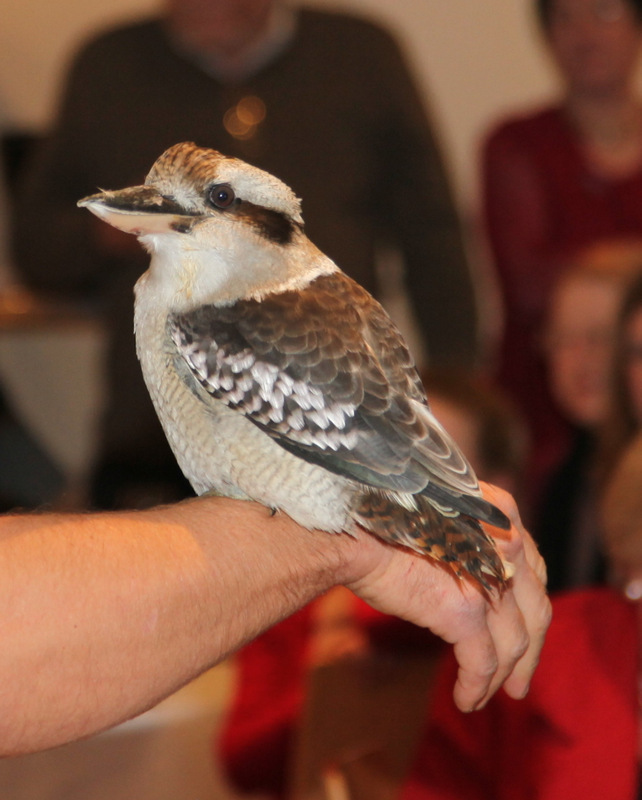 The kookaburra “Chucky” and the young koala were photographed at a wildlife presentation by Chris Humphrey of Wild Action. 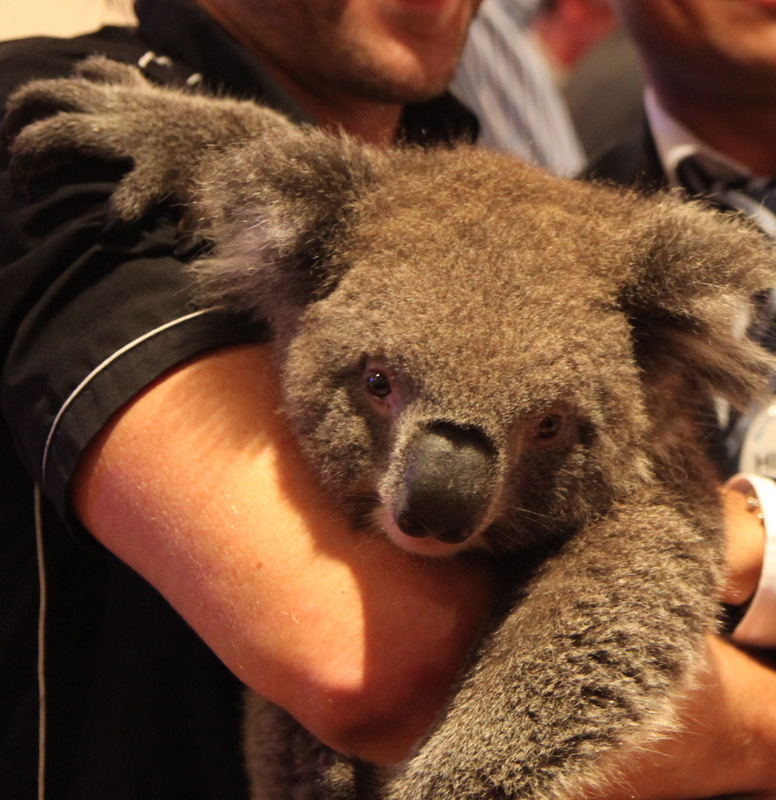 I hope you have a Happy Australia Day wherever you are. 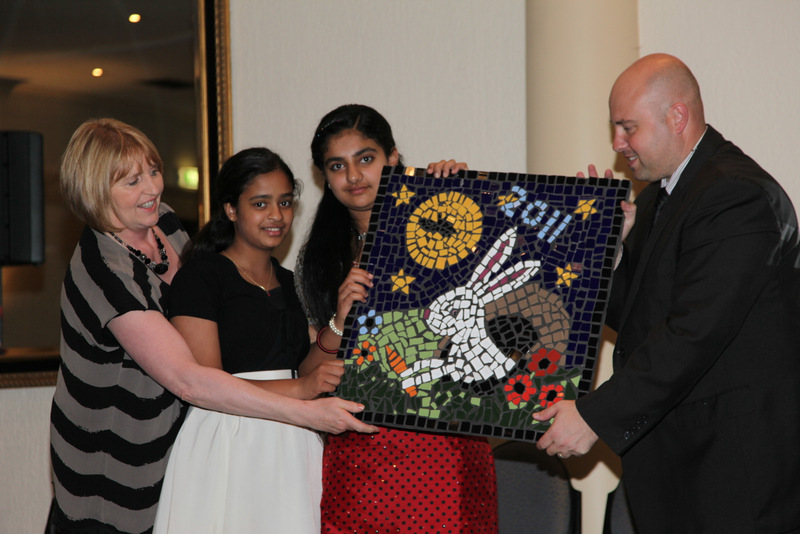 Each year at Taylors Lakes Primary School in Melbourne, Australia, our Grade 6 students make a group mosaic. It is presented to the School Principal by the designer/s at Graduation to leave at the school for the future. Following the Chinese Calendar and beginning in 2005 with the Year of the Rooster we have made a Dog – 2006, Pig- 2007, Rat- 2008, Ox- 2009, Tiger 2010 and recently the Rabbit in 2011. 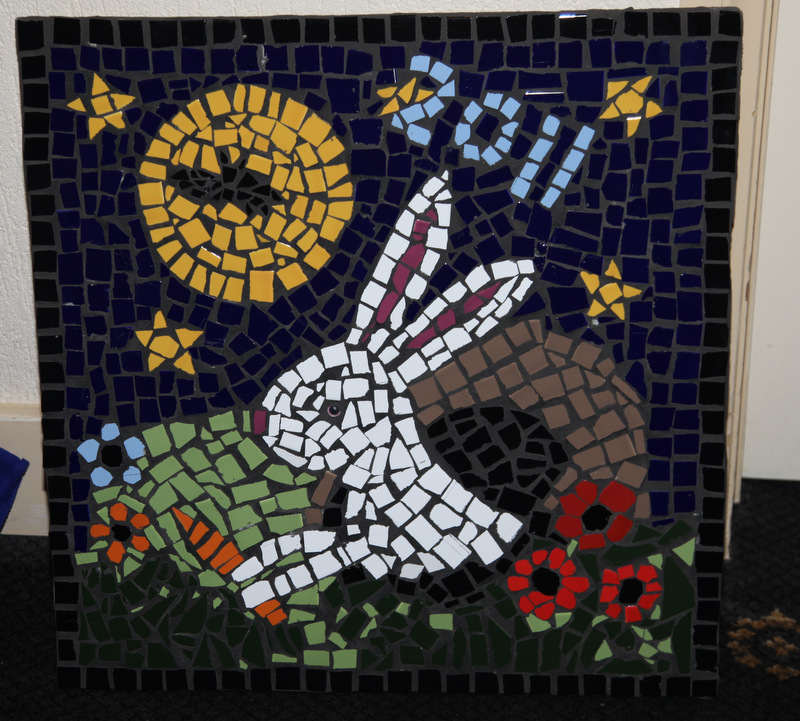 Each measuring 60cm by 60cm, the mosaics are displayed on a wall near our Library. These photos show the difference grout makes, filling the gaps between the tiles. I want to stress that it is all the students’ work. 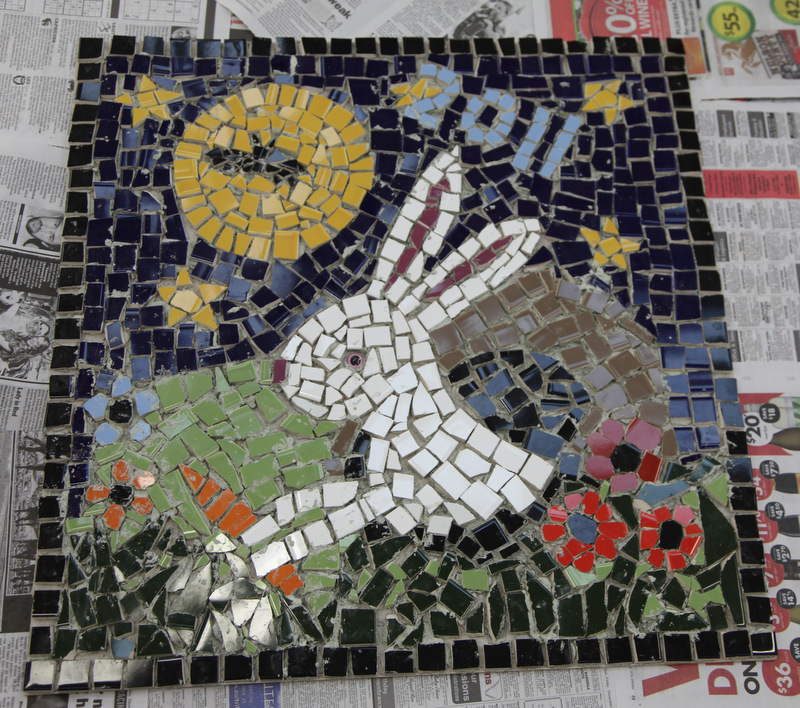 I do the grouting as it is so time critical and it is better if there are no interruptions, something which rarely happens at school. I hope you like their work. They would really appreciate your comments. 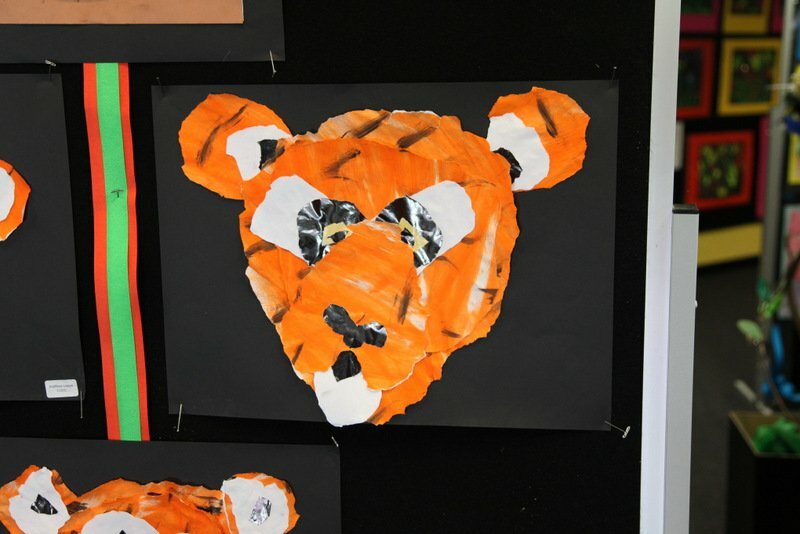 The wonderful thing about the Internet access we have today is that whenever we are short of ideas for Art activities there are thousands available online. 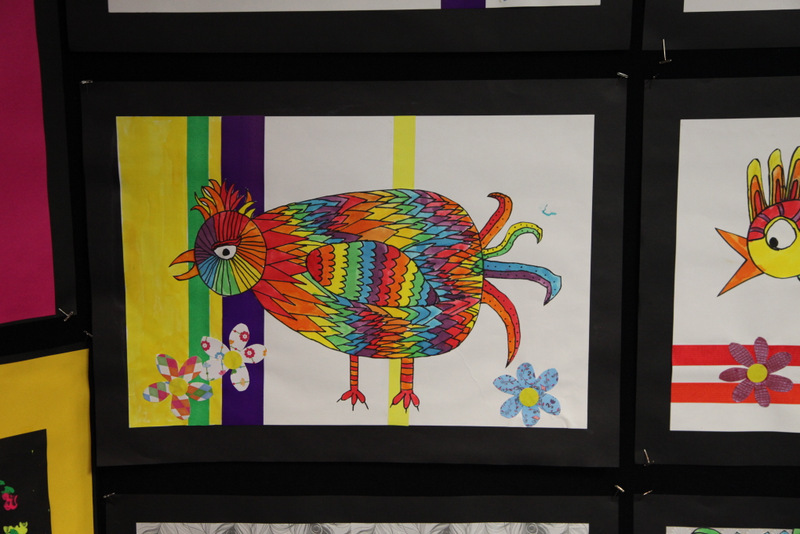 Hundreds appear on Zart’s excellent website in their Student Gallery. I took this photograph back in 2007 at the Gallery and we have since used it as inspiration for our student work on Asia. It is not always the work OF our students which appears on our blog but it is FOR the students of our school. To inspire them is to improve the quality of their work and help them see what’s “out there”. 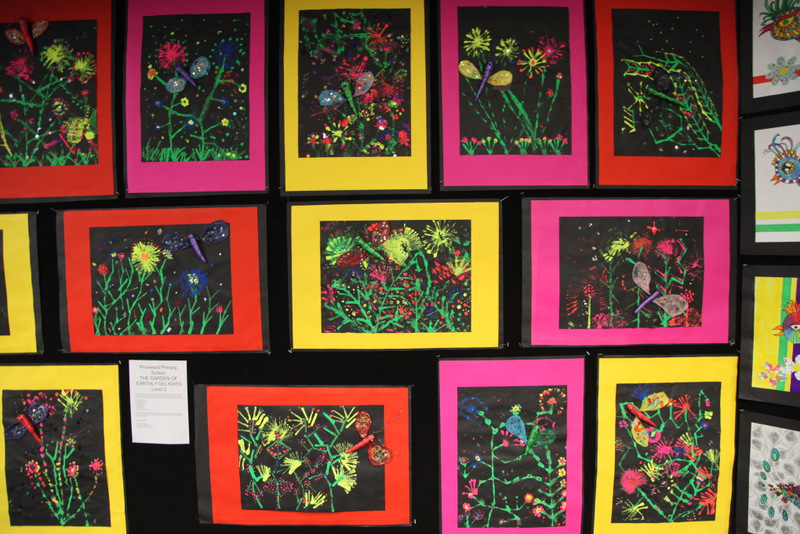 Our thanks go to the past students of Dingley Primary School who made these brilliant artworks. Mobiles were one of the series of artworks beginning with M which our Grade 5 and Grade 6 students could choose to make during the last weeks of the 2011 school year. Our school year follows the calendar year here in Melbourne, Australia, so we are now enjoying six weeks of Summer holidays. Sarah, of 5AR, chose to sew and stuff these five felt animals and then she hung them on an old wire coathanger covered with chenille stems. American sculptor Alexander Calder is said to be the inventor of the mobile. 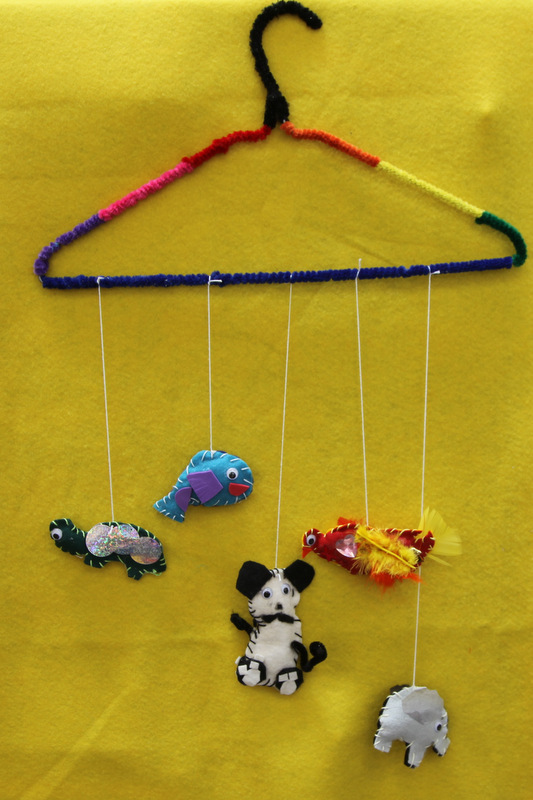 If you are just “hanging around” in the School Holidays why not try to make your own Mobile? School holidays provide time to explore the Web via Twitter suggestions for blogs which interest and inspire. Colossal Art and Design has a gallery of incredible Art works which will inspire and surprise. 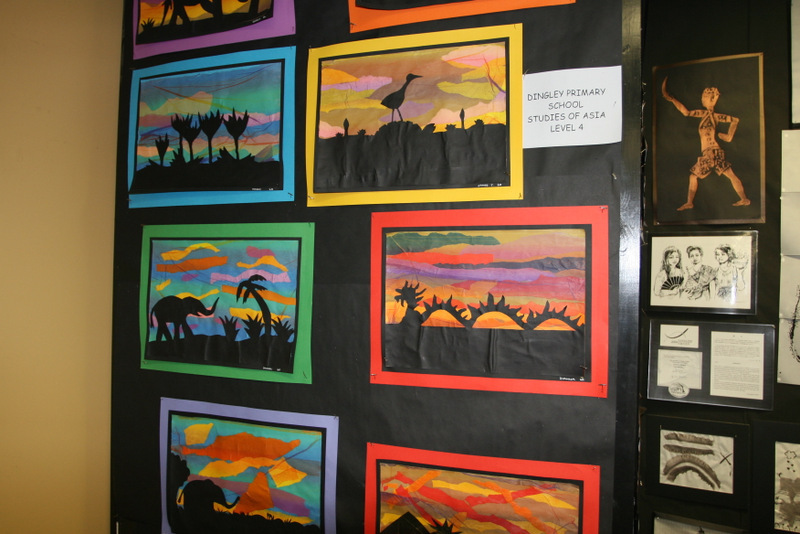 I was led to this via Karen Steffensen’s Blog All About Arts. 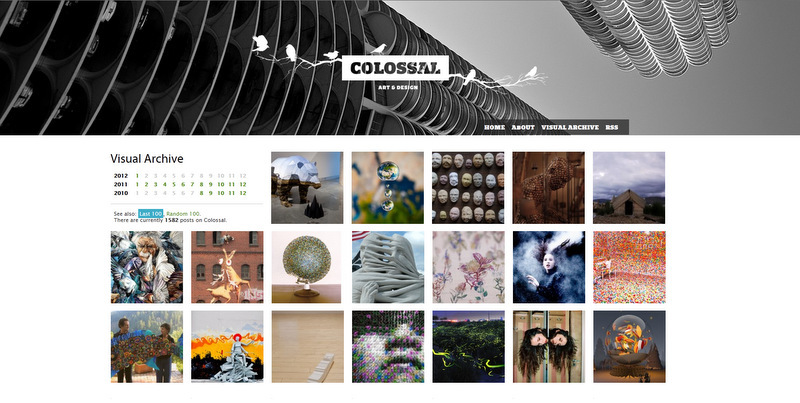 Which sites have you found recently which might inspire our Visual Arts students in 2012?